Heat oven to 375°F. Place pancakes in single layer on ungreased cookie sheet; cover tightly with foil. Bake 7 to 8 minutes or until pancakes are warm. Cool on cooling rack. Meanwhile, in small bowl, mix cream cheese, lemon juice, pepper and pepper sauce. Spoon about 1 teaspoon cream cheese mixture onto each pancake. Top with smoked salmon. Garnish with chives. This pickup appetizer is well suited for a buffet. 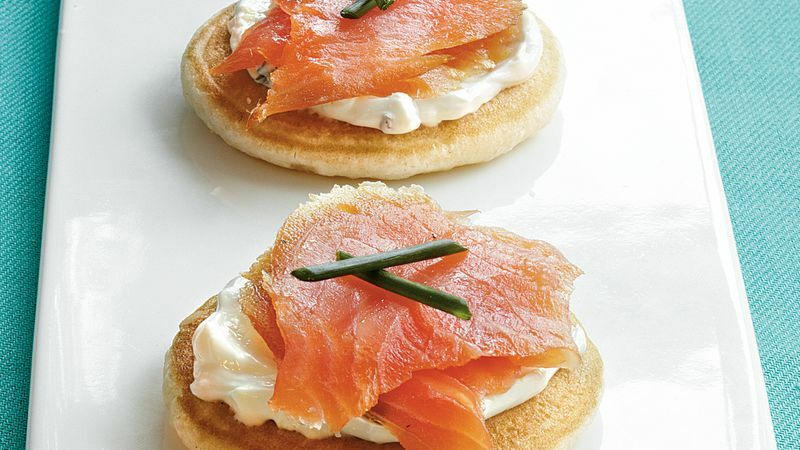 Pair it with a sparkling white wine for a special occasion.